You can count on the professionals at Monticello Plumbing and Heating to get your water problems solved regardless of what they may be. 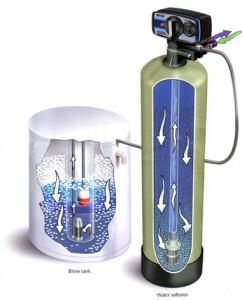 Having both soft and iron free water is very important with today’s modern appliances. You also need to make sure you are keeping your softener full of salt, which is why we offer salt delivery. We bring the salt right to you, and haul it down and put it in your system, so you never have to lift a bag again. We also check out your system to make sure it is set correctly, and is running at peak efficiency. Prolong the life of your water heater, dishwasher, and faucets. Save money with less soap and detergents. Whiter whites from laundry and softer clothes. According to the United States Geological Survey (USGS), 89.3% of US homes have hard water. That makes hard water the single most widespread water problem in American homes today. In addition to water hardness, consumers are also growing more and more concerned about the purity and safety of their drinking water. Escalating media reports of contamination or abnormal levels of impurities are causing some consumers to rethink how they use the water that flows from their taps.